Roll dough into approx. 12" x 15" rectangle. Cook sausage. 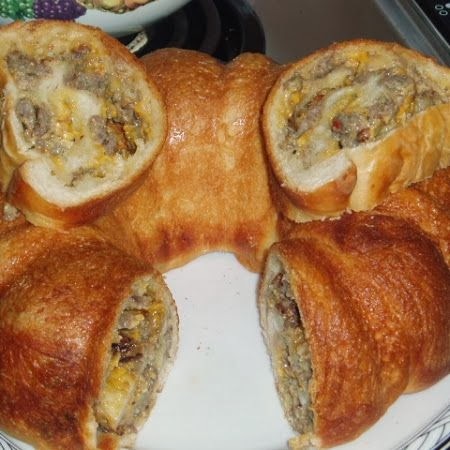 Mix cooked sausage, shredded cheese and eggs. Spread mixture on bread dough. Roll dough with mixture inside like a jelly roll and drop into a greased (Pam spray works also) bundt pan. Let rise in warm area until puffy (about 1 hour). Egg setup is with platesetter (feet down) at about 375 dome temp. Place bundt pan on platesetter and cook until top is golden brown (usually about 35 to 45 minutes). Invert bundt pan onto cutting surface and then brush butter on all sides of bread roll. Slice and enjoy. I quite often do the prep and assembly the night before and leave in the bundt pan in the fridge, covered with a wet towel to keep dough from drying. The next morning take the bundt pan out of the fridge before starting the Egg. By the time the Egg is ready and stabilized the dough has warmed up and risen some.